Red Empire Modern Staunton Chessmen. Tired of the same boring variations on the Staunton design? 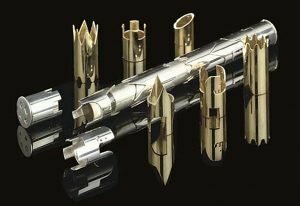 Searching for some truly unique chessmen to grace your favorite chess table, a new paradigm perhaps? 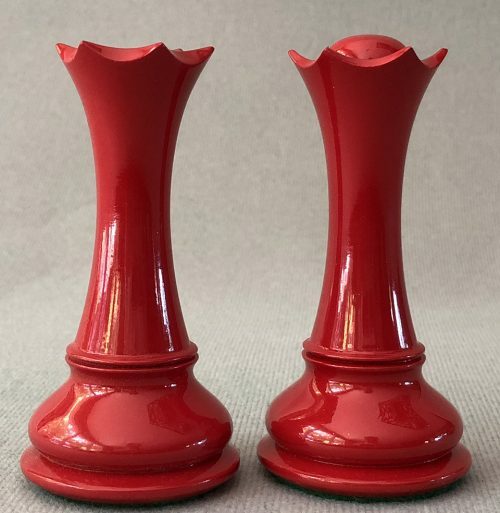 Then here is a refreshing approach to brighten your chessic landscape – the Red Empire Modern Staunton Chessmen, designed by renowned chess set designer and historian Frank Camaratta. These chessmen feature a strong hint of the Art Deco that is reminiscent of the 1920s. They completely capture the essence of a serious set of chessmen, while at the same time maintaining a look of pure elegance. 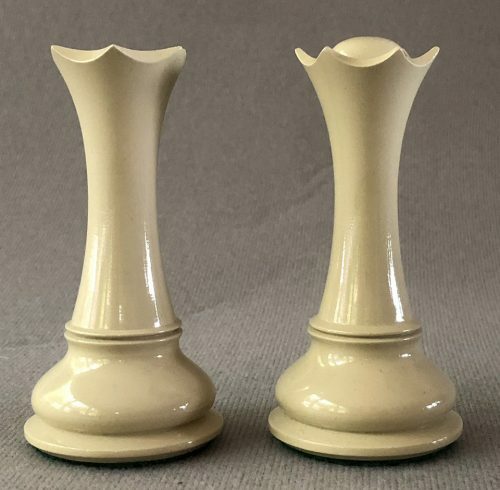 With their graceful, up-swept stems and piece-to-piece design consistency, these chessmen make a statement like none other. This is a full Club-sized Chess set that features a 4-1/2″ King with a 1-7/8″ diameter base. The Chess pieces are heavily weighted with embossed English Leather base pads under the Kings and luxurious billiard cloth base pads cushioning the other Chess pieces. 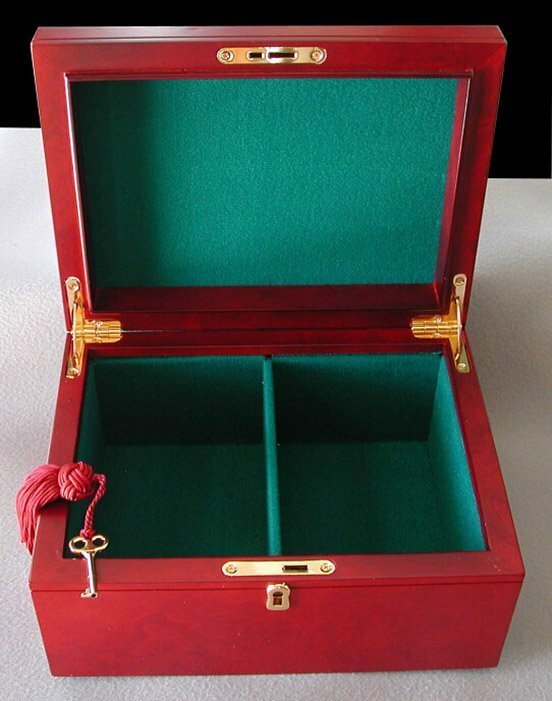 The chessmen are housed in a Premium Mahogany box with a uniquely numbered label signed by Frank Camaratta. 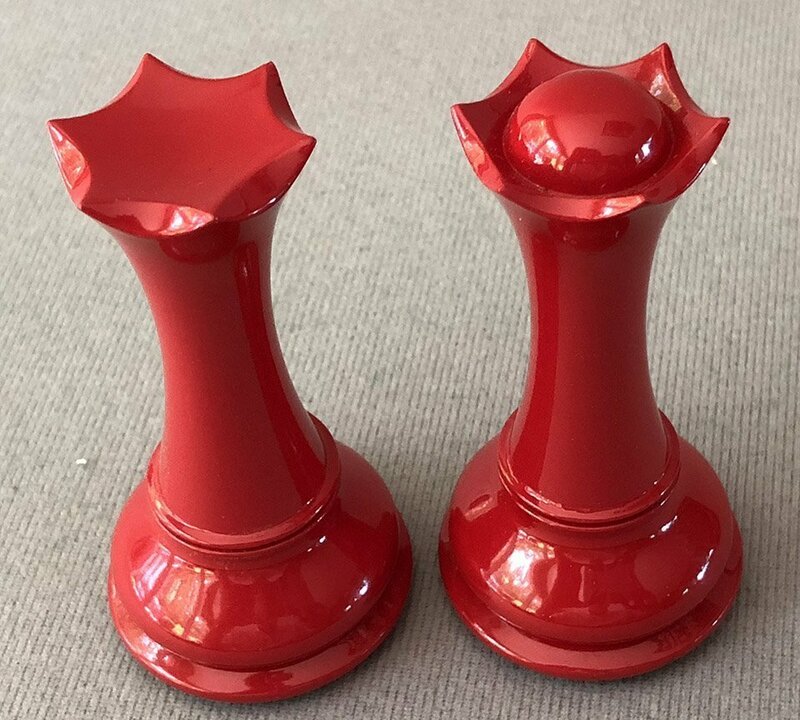 To accommodate Pawn promotion, this set of 34 Red Empire Modern Staunton Chessmen is delivered with a second set of Queens, a standard that was introduced by Frank over 10 years ago. The two Queens have slightly different features that allow the player to identify the promoted Queen during play. The Rooks are represented by a stout, stately tower that projects the proper force for a major piece on the chessboard. 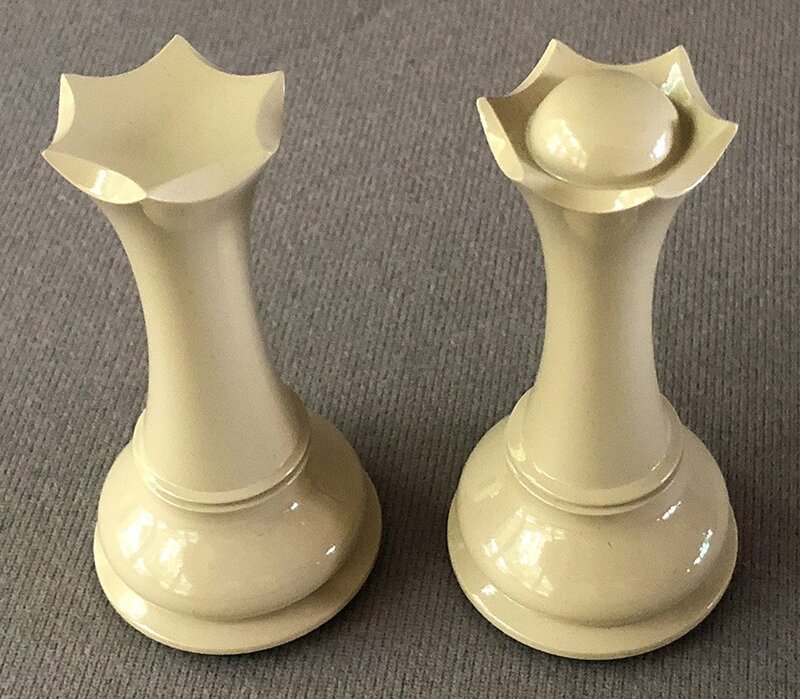 No previous set of Chessmen have been able to so completely capture the essence of the Staunton design while maintaining a look of such elegance, simplicity and clarity. The pieces seem to melt and conform to your hand. They just feel right. The design, quality and craftsmanship of this set is UNMATCHED by any set of Chessmen in its price range. Nothing even comes close! The Red Empire Modern Staunton Chessmen are ideal for enthusiasts and collectors that are looking for a set of heirloom quality chess pieces that is a true work of art, one that is as beautiful as it is functional. 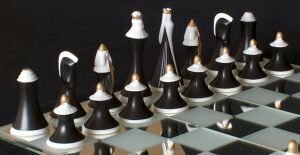 While the design of the Chessmen is elegant, don’t let that fool you – the pieces have been designed to withstand the rigors of practical play while maintaining an elegance which has become the hallmark of a Frank Camaratta designed chess set. There are no fragile details subject to breakage, such as collars, ball finials and Queen’s crenellations normally found in conventional Staunton chessmen. The Empire chessmen are available in several different wood combinations. 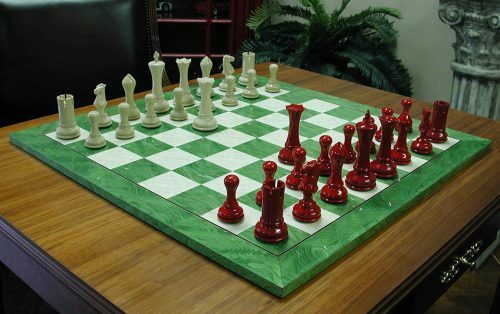 Shown here are the chess pieces in Ivory and Red Lacquered Boxwood. Natural and Black lacquered finishes, as well as Boxwood and Ebony and Boxwood and Blood Rosewood are also available. The chess pieces are designed for play on chessboard with 2-3/8” or 2-1/2” squares. 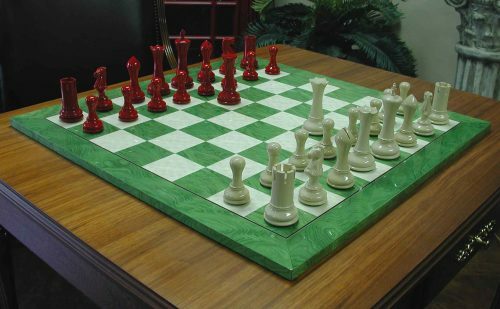 The Green and Birdseye Maple Tournament Chessboard shown here is not included. Looking for a suitable chessboard to display your new or antique heirloom? To view our extensive collection of new and antique chessboards, please click here. The House of Staunton was founded in 1993 and incorporated in 1999. When building the House of Staunton, Frank’s vision was to create chessmen that captured the feel and exquisite old-World craftsmanship found in those early Jaques Staunton pattern chess sets. In line with that pursuit, he needed to recreate the masterful workmanship of the Knights which were derived from the noble steeds whose visages are captured in the Parthenon frieze (expropriated in 1806 by Thomas Bruce, 7th Lord of Elgin and since referred to as the Elgin Marbles). The distinctive, finely detailed Knight head was the hallmark of the original Staunton design. that unique feature is evident in every Exquisite set of House of Staunton chessmen designed by M. Camaratta.